This is old (even older than McFarlane's Haunt), but I hadn't realized how many people hadn't seen this yet. This is Smash, a new comic written by Jeph Loeb (Nooooooooooo) with are by Rob Liefeld (Nooooooooo). Yes, this nightmare team of creators has decided that the world needs more poorly-written comics starring characters with no feet. I'm not sure which is the worst creator team-up ever, Loeb-Liefeld or Liefeld and director Brett Ratner who are working together on the Youngblood movie. There's also something else about Smash. He looks vaguely familiar. I don't know, maybe somebody can figure this out. I do have the most creative origin for him. "Scientist Dirk Danner was an expert in Delta Rays. During one of his experiments, a young boy on a skateboard named Nick Cones a Delta Bomb test that Dr. Danner has initiated. Danner runs out to save the boy, but gets caught in the blast. 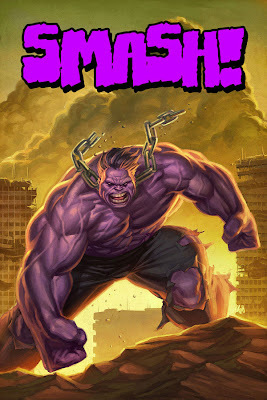 Now, whenever Dr. Danner gets horny, he turns into a giant purple monster, the Unbelievable Smash!"